I could not wake up this morning! So much for going to that spinning class at 6am at the gym! Oh well, I finally dragged myself out of bed at 6:30 and made due with 30 minutes of weights at home – better than nothing, right? Plus, I was in desperate need of some weight lifting, even though my arms are exhausted from my swim last night. 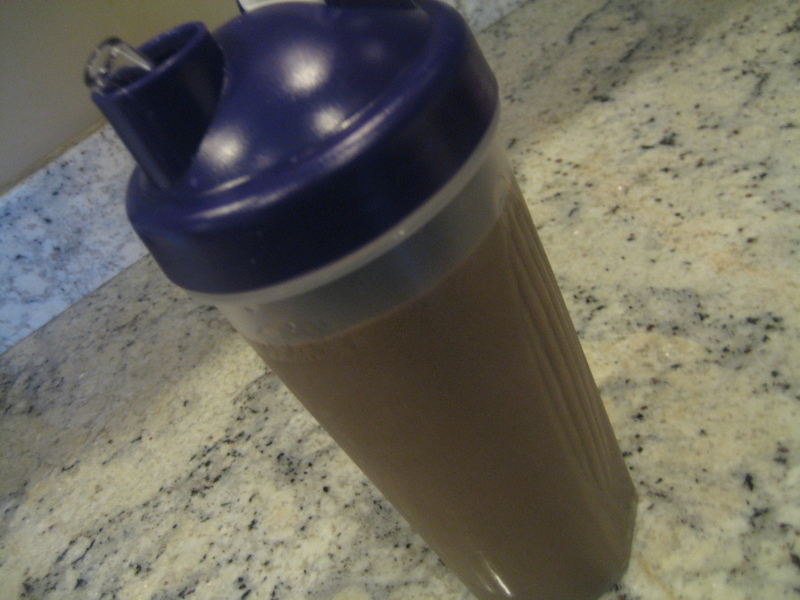 After weights, I made an ice cold super cherry chocolate bomb smoothie for the road. My new travel smoothie cup is awesome! Phew – super smoothie (read about my ingredients here)! I recently decided to use frozen spinach in my smoothies instead of fresh spinach because I found that the spinach I was buying for smoothies was going bad so quickly! When I have fresh spinach, I will obviously use it, but frozen is perfect when in a pinch. My super smoothie kept me full until lunch – maybe it was the yogurt I put in that filled me up. Lunch was a salad, apple and yogurt. 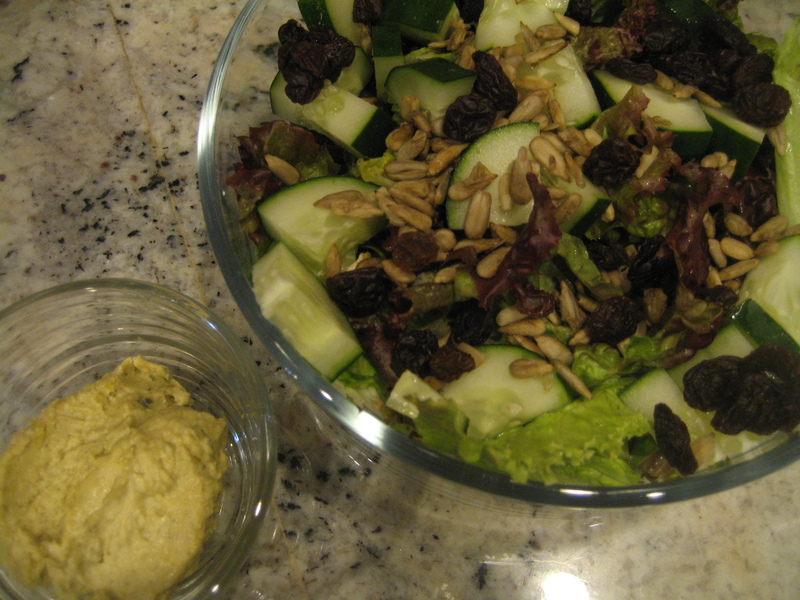 Salad with red leaf lettuce, cucumbers, garlic & salt sprouted sunflower seeds, raisins and spinach & artichoke hummus. 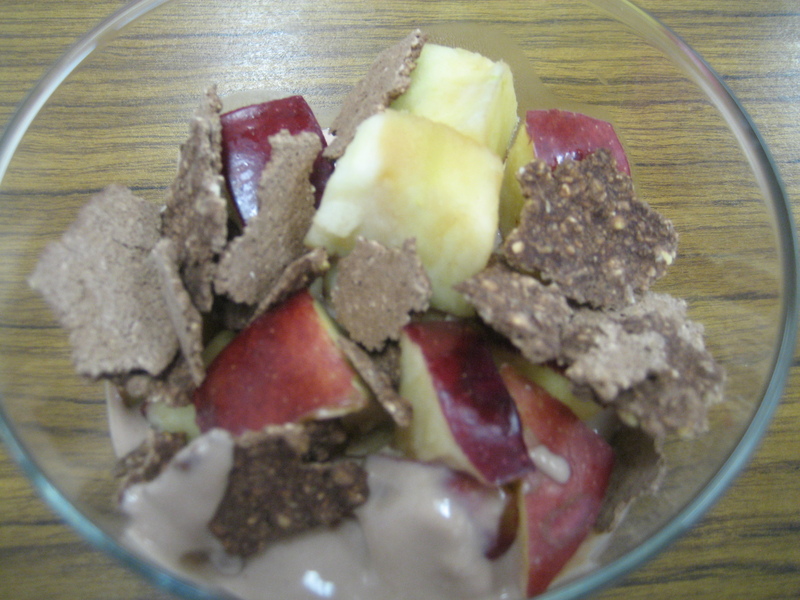 For my lunch treat I snacked on a Chocolate Chobani with a warmed apple and Chocolate Crispies from One Lucky Duck! 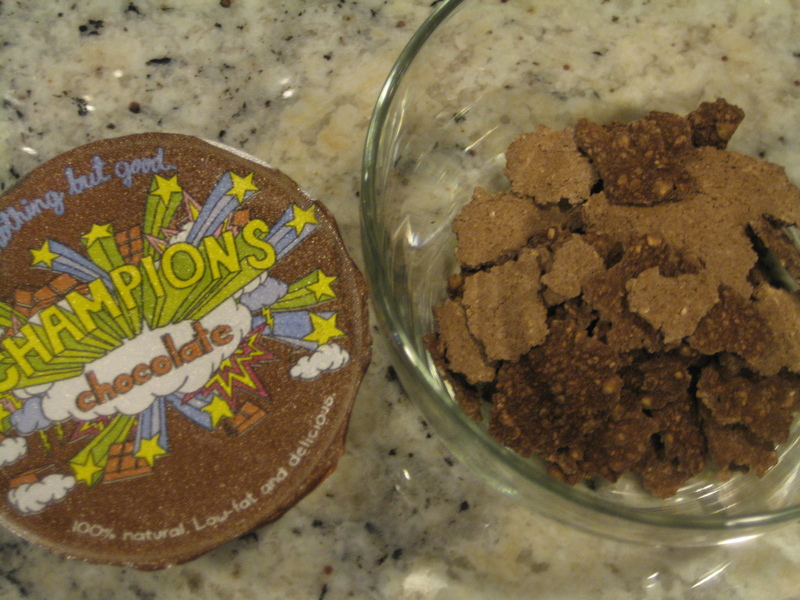 I bought the chocolate crispies on my trip to NYC last weekend. 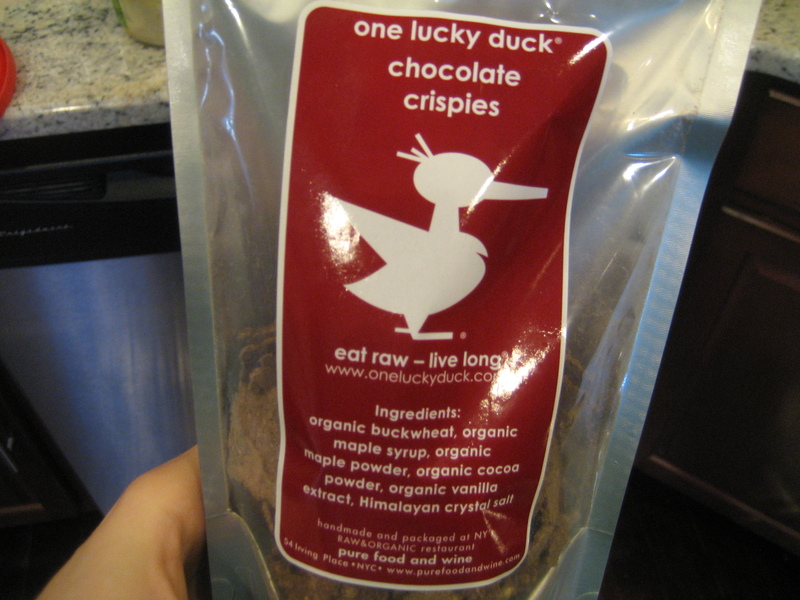 They are sprouted buckwheat groats and Peruvian cacao with a stellar ingredient list (organic buckwheat, organic maple syrup, organic maple powder, organic cocoa powder, organic vanilla extract, Himalayan crystal salt), and are very tasty and completely raw! They made a perfect, crunchy addition to my yogurt. Random note, but I’ve been thinking lately about how much I love blogging! I already think that I eat pretty healthy, but this blog has made me eat even healthier. It makes me eat enough fruits, veggies, proteins, fats, etc. each day, which has proven to increase my energy and happiness! I don’t always show every single thing that I eat, but instead try to show you healthy options for recipes and snacks. I am always on a mission to find or create new healthy snack ideas for people on the go. It is definitely better to fill your meals with nutrients, but sometimes you just need a snack! Excellent article as always, thanks for writing all this informative content on a regular basis.